I know it’s not the usual site content, but PNL was born from my dislike of vendor documentation, and crappy documentation is not limited to the world of IT. The 12v power socket in my A6 wasn’t working, this was probably because there was a 1p coin stuck in it that took a lot of fishing out, I assumed the fuse had blown, and put up with it for a while. When I finally got round to sorting it out today, I opened the ‘owners manual’, and looked for information on fuses and fuse box locations. 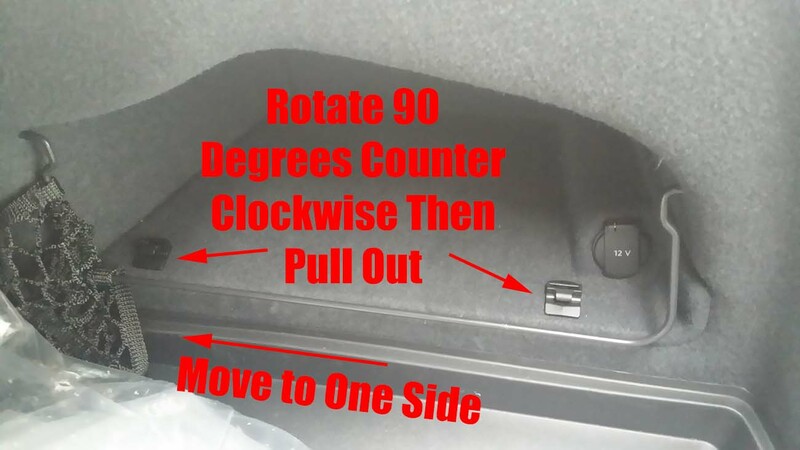 Turns out I have three fuse box locations, one in either side of the dashboard, and one in the boot, (or trunk for our American visitors). It showed a zoomed in diagram of the fuse numbers and locations, and what each fuse was for, (which also turned out to be incorrect). What it didn’t say was where it was. I rang the Audi Garage, no one was available, I rang another one, who was obviously doing what I had done and was Google searching it, (I could have saved him some time I’d spent an hour online). The best information I got was “it’s on the right hand side of the boot below the recess with the net over it”. This is true, but getting into it is another story. 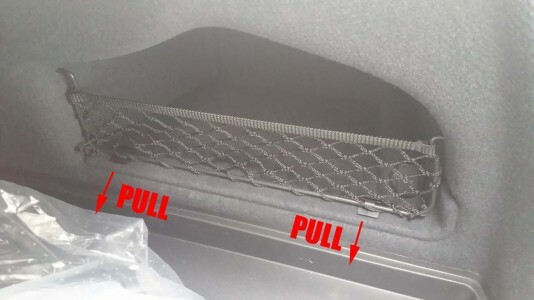 On the right side of the boot is a recessed area with a small net over it see below, the net is held in place with a thick metal bar/rod, which will ‘pop out’ if you pull it and swing up through ninety degrees. The two catches that hold the bar in place need to be removed, rotate them though ninety degrees anti clockwise, and you can withdraw them. Now the base and rear of this recess are one piece that can be removed, (be careful the 12v socket shown above will come away also and is still connected, (that’s the wire you can see bottom right). The pink coloured fuse coveres will just ‘pop off’. The 20 Amp fuse, (indicated) is for the 12v power supply in the front center console (cigarette lighter). The 20 Amp fuse next to it is for the rear center console AND the boot 12V power supply. Thank you for this. You save me a garage visit and now I know where fuses box are. Thank god, i checked every fuse in the dashboard fuseboxes all ok, the owners manual shows this fusebox but would have struggled to find it without this, well done sir! What a star. After an hour with the wheel out I read this and had sorted in 2 mins. Shame on Audi with their crap pics!! Awesome work! I would never of located it without this info !! Great instructions. The only difference on my 2016 A7 was that the metal bar had to be pushed inward to release and then it would swing out and up. It’s possible that this was due to someone putting the clips in backwards. Not sure. And, on the 2016, there is only one 20A fuse there. First time I needed to use a socket was today when the tyre pressure monitor gave a warning. 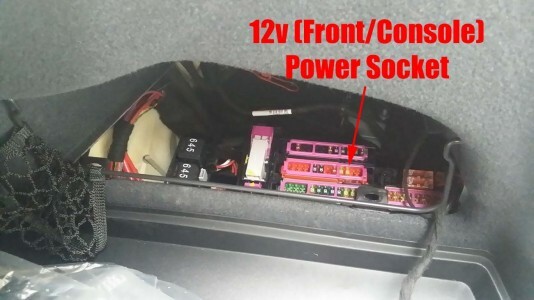 Went to use the electric pump, no joy, the manual for my 2017 A6 Avant was clear, a single 20 amp fuse in position 7 of the brown holder in the boot compartment on the right hand side behind the trim was the one. However had to come here to find out how to remove the trim. On mine the lugs on the bottom don’t turn at all, the bottom is simply hooked in but you have to insert a screw driver carefully into the top to gently lever it out. The manual is useless for simple things like this. Luckily I had a spare fuse, swapped it over and hey presto the sockets worked and I was able to check the tyres. 🙂 Thanks for the update Dave! I have an Audi A6 Avant 2012 and all three of my Cig lighter sockets have stopped working. I have replaced the fuses and still no joy. I spoke with a retailer when purchasing replacement fuses and he suggested that, if after replacing the fuse the sockets still do not work, then it may be a relay that may be at fault. Does anyone know if the cig lighter sockets have a replay and if so where they are located? would this be the same for an a4 2015 model?